Technology: Tool and Die Making Services are machine shop services specializing in the manufacture of jigs, fixtures, die sets, etc. which are used in other manufacturing operations. Tool and die makers will build tooling for use in machinery owned and operated by others but in many instances will build tooling for use in their own machinery. In these instances, the tool and die makers deliver finished goods to their customers. While there is some overlap between machine shop services and tool and die making, tool and die making invokes a certain level of precision pertaining to the close fits with which die sets for stamping, etc. must be made and assembled. When it comes to machining, tool steels are less forgiving than other common machined materials such as aluminum. Some tool and die makers will specialize in particular tooling types, injection molding dies, for example, while others will build to more general requirements. Advantages: Tool and die making services can offer expertise when it comes to design for manufacturing. Many firms specialize along industry verticals and can advise on making products for those industries, medical product injection molds, for example. 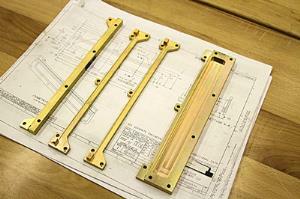 Applications: Tool and die making services are employed where high precision manufacturing tools are required.